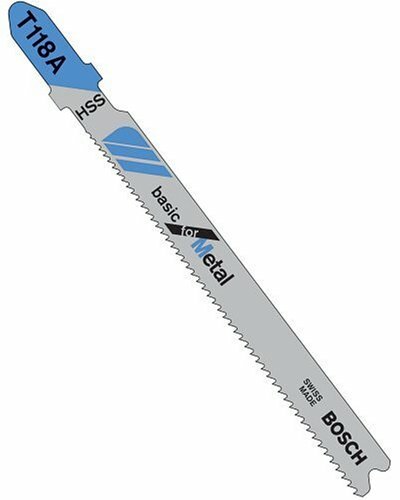 5 Pack, 3" 24 Tooth Metal Cutting Jig Saw Blade, For Metal Less Than 1/8", For Thin Material, Straight Cuts In Metal, Non-Ferrous Metal, Aluminum, Sheet Metal 1/16" - 1/8", Fits Bosch Models 1581AVS, 1581AVSK, 1584AVS, 1584AVSK, 1587AVS, 1587AVSK, 1587AVSP, As Well As Other Older Bosch Models. These blades go great in my Bosch Progressor jig saw when its time to cut sheet metal. For this job, I always clamp the metal down to a piece of scrap plywood then cut through both metal and wood with one of these blades using a mid-range orbital action setting on the jigsaw. By going slow and careful, this produces clean and fast cuts in the sheet metal without the vibration and noise you get when not using a backing material. 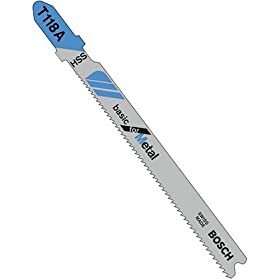 I wouldn't put anything but genuine Bosch blades in my Progressor jig saw. Actually these blades DO fit a number of other jigsaws. Good blades, but Festool is 1 lb lighter and has a true dust extractor system, AND takes a Collins coping foot (which the Bosch 1590-1591 will not). Bosch blades are still great. Use them with other saws, too. 5 stars if they came in 145 or 155 mm lengths for sandwich materials, as Festool blades do. My Bosch jigsaw and these blades are such an improvement over my old (like 40 years old) Black and Decker that my professional builder friend who is helping me remodel my house was very impressed. I used it mainly to cut composite decking at first and the blade seemed to last forever and it even cut Hardy Plank siding for small holes when needed (even though it dulled pretty quickly as does every other blade on this cement -based product).